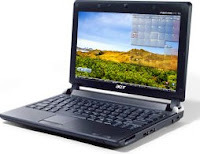 Netbook Acer Aspire One AOP531H is Intel Atom processor-based Acer is promoting the ease of mobility with little design an elegant and charming. This product brings the spirit of "Anytime, Anywhere, Everyday Computing" for ease of computing and connect to the Internet anywhere and anytime. Genuine Windows® XP Home Edition, Intel® Atom™ processor N270 (1.60 GHz, 667 MHz FSB, 512 KB L2 cache), Mobile Intel® 945GSE Express Chipset, 10.1" WSVGA (1024 x 600) Acer CrystalBrite™ LED Backlight, 1GB DDR2, 160GB HDD, Multi-in-one card reader, Bluetooth® 2.0+EDR, 3-cell battery, Black color. Suitable for people who are mobile and need a computer to perform tasks anytime, anywhere. The screen size 10.1 "will not make it look for whales, but also do not need a magnifying glass to use it. Very fitting for us. 1 Response to "Netbook Acer Aspire One AOP531H"
How does Acer compare with other computers?